Bread was the staple diet of everyone. Until the Americas' were discovered we didn't have potatoes in our diet, so the main "filler" for every class was bread, even the King. The field would have been ploughed in autumn. Breaking up the soil and turning it over, lifting out the weeds and turning them back under with each furrow. This would have been done by a man and his team of oxen and a wooden plough, probably with a metal piece made by the blacksmith, on the cutting edge. The field would then have been harrowed. Again done by a man and his oxen, this time pulling a harrow, made of wood, and looking like a large rake, and having the same action and purpose, of breaking the large clods of earth down to a fine tilth. Finally the seeds would have been sown. The general practice was to get this done in autumn, early winter; if left to the spring the ground was wet and cold and could delay the working of the fields and germination of the newly sown seeds. As the wheat started to sprout in spring it was very often the job of the children to go out into the fields and be human scarecrows to keep the birds off this very important crop. Weeding by hand was done several times in the early stages of growth - imagine weeding a whole field! Just as farmers today are at the mercy of the weather to give rain to make the crops grow, and sun to ripen the crops, and hopefully stay fine whilst harvesting, so were the Tudor farmers. Unlike today a poor harvest couldn't be supplemented by tons of foreign grain, people went hungry, and even starved. The wheat of today is different to that of Tudor times, we've bred different strains to suit our needs. The stems were much longer in Tudor times. These, when dried, are straw, used for thatched roofs, bedding for animals, in matresses of the poor. As it was cut by hand using a sickle it didn't matter if the wind had knocked it over, and the longer length of straw was needed by the thatcher. Today our mighty combined harvesters can't cut and harvest the ears of corn if it's lying flat, so wheat with a much shorter stem was bred. The harvested wheat was bundled up and put into "stooks" round the field to dry, then moved to large barns. Since it is very difficult to steal much wheat when it's kept in bundles on the stem, and it keeps better this way; the ears of corn were thrashed as and when needed. Many barns were built with two doors, central and on opposite sides of the long walls; one opening being much higher than the other for a fully loaded cart to bring the harvest in; and the opposite door being smaller, for the empty cart to leave by. Both these doors would have "thresholds", or wooden planked, that fitted across the whole doorways to stop the valuable grain blowing out. 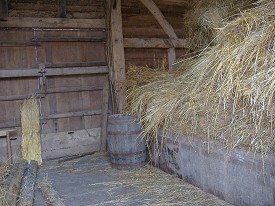 Both doors would have been opened to allow a breeze to blow across the barn, then bundles of wheat were placed on the floor, and workers with their flails - two pieces of wood loosely joined with leather so that one piece was held in the hand and the other piece could be swung around - would beat the wheat and the ears of corn would drop the grain onto the floor. Because bits of straw and the outer casing - chaff - of the grain were mixed in with the grain it had to be winnowed. This was where the breeze came in to help. The grain was placed in a large wicket basket, that was "scooped" shaped, and this was thrown up in the air, the chaff, being lighter, was carried down the barn on the breeze (and could be collected later to mix in with the animal feed), and the grain would drop back into the basket. The grain was then taken to the local mill to be ground down to flour. The local landowner owned the mill and a percentage of the flour was collected in payment and taxes. It was against the law to have your own quern stones to grind your own grain. Your flour was kept in an "ark", a locked wooden store. The very rich would eat white bread, a show of their wealth. They had the servants to stand, and with piece of muslin between two of them, they would sift the wholewheat through the muslin, leaving just white flour in the trough below them. Inside Cowfold Barn behind Bayleaf Farmstead with wheat stored on the stem. Barley was grown to brew the ale that everyone drank from the age of four upwards. Although homes were built by a water supply, river, lake/pond, or well, this was for domestic use and the animals - hence the reason no-one drank water! Only the very young or very old drank milk, and most of that was sheep's milk. Every household brewed ale from the barley on a regular weekly basis. It wasn't the strong beer we have today. The first brewing with fresh malt was the one that would be the strongest and would keep the best, this was for high days and holidays. As the malt was reused so the strength of the ale went down, and so did the length of time it would keep. The last brew was often called "small ale" and drank daily by everyone, including children. 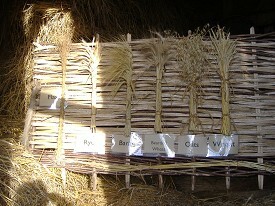 Crops grown in different conditions round the country for harvesting. With no fridges and freezers, and very little in the way of food crops growing through the winter, peas and beans were grown in fields, as they could be dried and kept for use during the winter. Fields were left without crops or animals in. These meadows were left with the grass growing long, then in early summer - and hopefully a second crop later - the grass was cut and left to dry, being turned in the sunshine. This hay was then collected, built into a haystack and kept for feeding the livestock, like the oxen, through the winter. 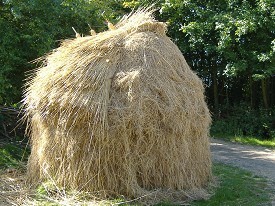 Haystack with a straw, waterproof, roof being put on it. It was very important to manage the woodland properly, trees were a very important commodity. Think of everything that was made of wood in Tudor times. Timber framed houses, with the walls often of wattle - woven hazel fencing - and daub. Furnishings, tables, chairs, beds etc. All tools, farming and household. Ships - needed for warfare and merchant shipping. For the poor, everything on their table, plate, spoons etc. Baskets made for storage and carrying items from hazel and willow. Fire - domestic fires every day of the year to cook the meal on. To make charcoal for tradesmen like the blacksmith. Trees also provide food - nuts, hazel, cob, walnuts; acorns for the pig; medicines from the berries, such as the haws of the hawthorn. 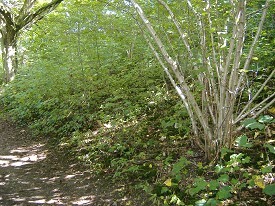 Woodland would be divided up into sections and you'd harvest each section just once every 7 - 14 years. Within a certain area you'd allow just a few trees to grow and mature without touching them, they are called standards. These standards would be for the timber frames of the houses and barns, ships timbers, anything that needed long, thick trunks. Oak being the best but slow growing. The rest would be harvested a lot smaller. Ash for tool handles, hazel being so flexible for weaving as fencing etc. Also trees like hazel don't die when cut down to near ground level, the stump, or "stool" throws up several stems of new growth, constantly regenerating itself. All the poor, farm labourers etc, were allowed to run their pigs in the landowners woodland. 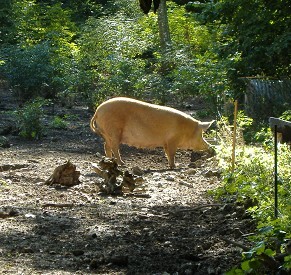 The advantage was the pigs got fed, they in turn fertilized the land and ate the scrub under the trees that were taking the goodness from the soil needed by the trees. Anyone was allowed to collect wood for their fires etc, but only from the ground, you were not allowed to break off branches or cut down trees that were not on your land. 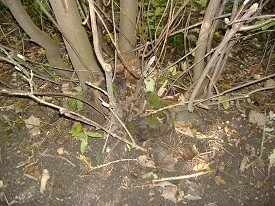 Woodland where pigs haven't been to clear the plants from round the trees. In the fore ground another hazel stool.